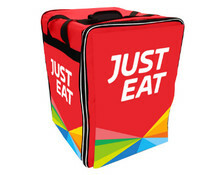 Just Eat Scooter box made of bespoke red correx-board material with bespoke reflective sides and rear for high grade visibility. Available in size 2386mm x 1004mm, with an interior Foamex panel for added stability. Just Eat Scooter box made of bespoke red correx-board material with bespoke reflective sides and rear for high grade visibility. Available in size 2386mm x 1004mm, with an interior Foamex panel for added stability. Our scooter box includes x2 high strength metal bungee cords which secure the scooter box to the rear of a bike through designated slots on the bottom panel of the scooter box, to ensure secure placement.